Constructed in 1877 to the design of F.M. Hynes and William Wardell of the Public Works Department, the Rushworth Court House occupies part of the former Police Camp Reserve (1853) and was an addition to the original court house (1857). Gold was discovered in Waranga in July 1853 and a police camp was established in August by William Willoughby, Assistant Gold Commissioner, at the southern end of High street bounded by Horne and Hyde Streets; it was the first settlement of the area. Willoughby was later joined by Richard Hengist Horne, an English poet and government official who is believed to be responsible for renaming the area Rushworth. In 1857 a small timber gabled building was constructed as the first court on the site and consisted of a public office and magistrate's room at the front and four administration offices at the rear. It was sited north of the existing building along two thirds of the exterior wall. A log lockup was built in 1854 and the first police building was constructed in 1864 for only £30 with a brick chimney added in 1867. A police station occupies a portion of the former reserve and was built 1887 and replaced in 1977 by the current brick building located north of the court on a portion of the original court house site. 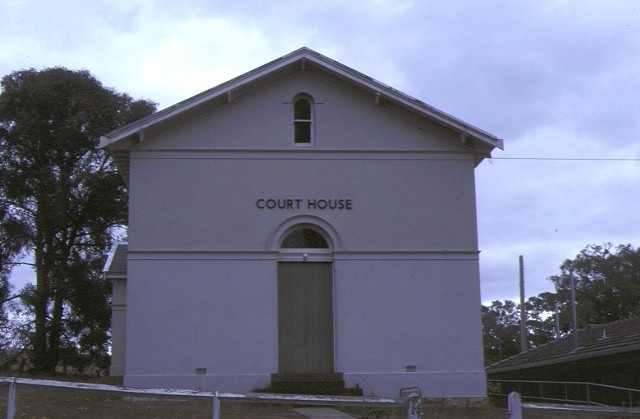 The Rushworth Court House is a simple Italian Renaissance Revival stuccoed masonry building with decorative eave brackets and string courses. Centrally positioned basalt steps and an arched doorway entrance lead in to a single volume court room containing panelled magistrate's bench, clerk's and jury docks and arcaded bench seat barriers. Located high above the court room on the northern and southern walls are four double hung sash windows. King post trusses support a timber lined gable ceiling. A transverse skillion addition at the rear was constructed in a similar design to the main court following the demolition of the 1857 structure prior to the construction of the first police station and contains magistrate's and clerk's rooms. The Rushworth Court House is the only surviving nineteenth century building remaining on the former Police Camp site. The Rushworth Court House is of architectural, archaeological and historical significance to the Sate of Victoria. The court house is architecturally important as an outstanding example of the conservative Italian Renaissance Revival practised under William Wardell at the Public Works Department. It is possibly the only intact example of such simplicity and austerity remaining in Victoria. The site of the Rushworth Court House is of archaeological significance for its potential to produce archaeological evidence related to the early police camp and original courthouse. 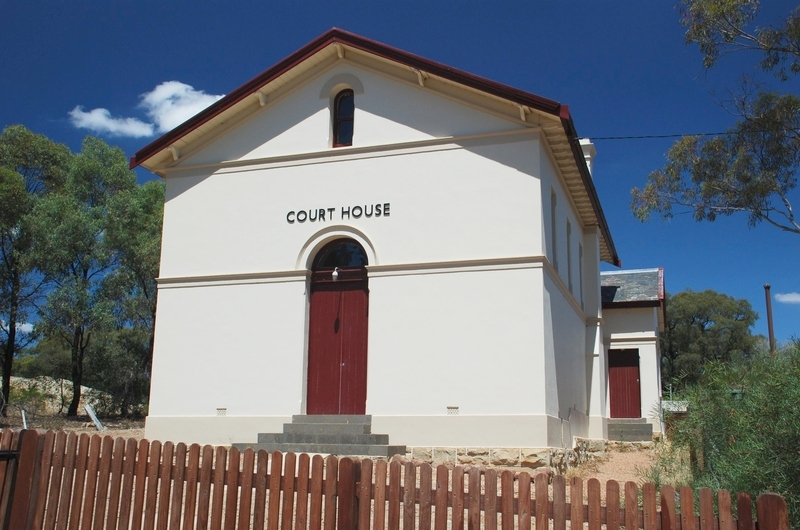 The Rushworth Court House is of historical significance for its association with the judicial system from the gold rush era, commencing as a police camp reserve (1853) joined by courthouse (1857, rebuilt 1877) and police buildings (1864, 1887 and 1977). Court House, High Street, Rushworth. General Conditions: 4. Nothing in this determination prevents the Executive Director from amending or rescinding all or any of the permit exemptions. General Conditions: 5. Nothing in this determination exempts owners or their agents from the responsibility to seek relevant planning or building permits from the responsible authorities where applicable. Minor Works : Note: Any Minor Works that in the opinion of the Executive Director will not adversely affect the heritage significance of the place may be exempt from the permit requirements of the Heritage Act. A person proposing to undertake minor works may submit a proposal to the Executive Director. If the Executive Director is satisfied that the proposed works will not adversely affect the heritage values of the site, the applicant may be exempted from the requirement to obtain a heritage permit. If an applicant is uncertain whether a heritage permit is required, it is recommended that the permits co-ordinator be contacted. The cultural heritage significance of Rushworth Court House lies in its architectural, historical and archaeological values. The registered land has historical archaeological significance for its potential to provide evidence relating to the use of the site as a police camp from the 1850s. Any works affecting the disturbance of below ground components of the site are subject to the Executive Director's approval. Any changes to the place other than those listed in the permit exemptions will be subject to permit approval.